Today, the digger driver arrived to backfill the trenches. It is always a sad affair, saying “goodbye” to a site. The smell of the topsoil as it was being pushed back into the trench by the JCB was the same as on the first day and really made me want to be back on site. Still, I know that we’ll be back next year and that there are exciting discoveries still to be made. Today is the end of the season and there is a real sense of winding down. I actually feel very emotional about leaving the site and slept badly last night as a result. We are excavating until morning teabreak, after which we will be recording, laying the geotextile and partly backfilling. At least we know that we will be back next year. This year, we have achieved a great deal (even though we have failed to locate the outer ditch!). When we arrived on site, there was still the possibility that we were dealing with a burial mound and we had little evidence by which we could date it (a rather nice sherd of Grooved Ware from the activity deposits in the centre was the star exhibit). Within the first two weeks, we could demonstrate that the site is definitely a henge because it has a secondary ditch cut into the outer ring of chalk and we had a reasonable quantity of Neolithic pottery, ranging from Grimston/Lyles Hill type ware to Grooved Ware, Impressed Wares being perhaps the most numerous type. We have large quantities of lithics, all débitage, as far as I’ve seen. There is also so much animal bone that we will be able to get some decent radiocarbon dates, at least for the second phase of the monument. We also have our central posthole, which turns out to have a smaller projection into the underlying material at the base of the post pipe, almost as if there has been a lug on the bottom of the post to locate it accurately in its hole. All the soil samples are now in the store at Burymead in Hitchin. I took twenty 10-litre buckets down this morning; this gives us around 30 samples in all (including a couple from last year). Today is going to be fairly disrupted, as we have the Open Day, a visit by Anglia News and who-knows-what else. Then there is the weather: there is a 40% chance of rain this afternoon. The site is already very muddy indeed and the walkways around the trenches have become quite churned up. The clayey topsoil is making everything quite slippery and people have been told to take great care when moving around. Progress with the north facing section of Trench I progressed well yesterday, despite the rain, reaching west beyond the inner ditch. The bank and everything else to the west end of the trench ought to be quite straightforward. Zoe is going to be starting the south-facing section this morning, so we may get most of the section drawing completed today. Mark is removing the carbon-rich deposit in the base of the post pipe. I hope that he will be able to move on to the posthole fill(s) later: it would be good to get at least one discrete feature fully excavated before the end of the excavation! We have still not found the limits of the outer ditch, which is a real disappointment. As one of the principal aims of this year’s work was to excavate a section through the outer ditch, not to have even found it is a bit of a setback. To confirm the early date I suspect for the site, we need to ensure that the outer ditch is primary and obtain good dating evidence from it; by the end of this season, we will still not be in a position to do this. The colluvium, (35), has turned out to be my bête noire of the site! Fill (105) in the inner ditch is producing a lot of finds. I suspect that we are nearing the base and that we are looking a primary deposition of material left over from activities inside the henge. It would be really useful if there were a large structured deposit in the base, which could give us a good date for its construction. There is still no real sign of edges to (59). However, most of the finds now seem to be coming from the centre of the deposit. Could this be indicating roughly where the centre of the ditch should be? It looks as if it is the right location but I’m not sure what sort of formation process would result in this phenomenon, though. On the next spit, the finds were more evenly distributed, so this does not seem to have been a real phenomenon. It’s good to be back on site; with only three days to go, there are some important tasks that must be completed before we put the site to bed for next year. The sections of Trench I need to be drawn (so far, only the north facing section east of the intersection with Trench IV has been done), there is stratigraphic data to be entered on to the context sheets and there are various cross-referencing tasks to be done. Dale has brought a laptop and spare batteries to site and is ensconced in his one man tent working on a 3D model of the site. The henge bank in Trench IV north looks really impressive. Unfortunately, it only looks good with binocular vision: a camera lens flattens it completely. Perhaps video will bring out the slope. There is a definite slumping layer on the front of the bank and there are quite a few finds immediately over the slumping, presumably brought down the hill by colluvial action; there has been a fragment of iron pan, which perhaps formed over the clay capping the chalk at the top of the hill (we don’t have any on this part of the field). Mark is planning a small deposit of carbonised material that appears to be at the bottom of the post pipe in the central posthole. It just might be the remains of the post, although the elongated shape of the pipe looks like one where the post has be wobbled back and forth to remove it from the ground. If this is the bottom of the post pipe, the ground surface through which the posthole was dug must have been considerably higher than the highest surviving archaeological deposit, perhaps even higher than the modern topsoil. What is it about Thursdays? Weather: pouring with rain first thing, but clear by 12.30 as everyone had gone home! The weather was horrible when I got up, cleared up and, by the time I arrived in Norton, was pouring again. The forecast suggested that it would stay wet until lunchtime, so I decided to send everyone home. Siân, Caoimhín and I have come in to the office to check the stratigraphic recording, as my brief attempts to construct a site matrix have been thwarted by the lack of accurate recording. It also gives us a chance to start on the post-excavation concordances for this year’s project. Having been away on Sunday, I feel slightly out of touch with site, but it has not changed hugely. The turf deposit in the inner ditch has now been removed completely, while the western edge has been clearly defined, making the feature more obviously a ditch. Over the outer ditch, (59) is being removed in spits and has as many finds as (35). The packing in the central posthole turned out to be just a shapeless lump of chalk, not a carved representation of the Neolithic deity of the River Ivel. Shame! In Trench I, the removal of (75) has exposed a new deposit beneath and is giving us our first real glimpse of the henge bank, which could survive to a reasonable height in this area. finish all cleaning and recording by 3 o’clock on Sunday afternoon to leave time to lay the geotextile. What we must not do this week is to enter a “winding down” frame of mind. To complete the excavation of the two discrete features, we need to maintain the pace of previous weeks. Indeed, if we are to define the outer ditch at all, the pace at the western end of Trench I needs to increase. It turns out that (59) is above (96), rather than the reverse. We still appear to be getting only Neolithic ceramics; I have seen only one sherd that I would consider to be of Beaker pottery and I’m not entirely convinced of that, as it could be Grooved Ware. The henge is clearly an early type, as I had suspected from its morphology. The presence of a berm between the bank and outer ditch is unexpected and I can’t think of any other henges with a similar feature (not that I am exactly an expert on henges!). This irregular feature could be another indication of an early date. It suggests to me that the berm acts as an arena for activities, perhaps for those not allowed inside the bank or for things considered inappropriate inside it. It is notable that the ceramics from the colluvium outside the henge are almost all Impressed Ware types, with very few examples inside it. Again, this suggests to me different groups or activities using the two spaces. This reminds me very much of Julian Thomas’s suggestion that Impressed Wares and Grooved Ware were used by different (and possibly mutually antagonistic) social groups. The inner ditch is still producing a lot of finds; it is still mostly animal bone and lithics. Weather: high wispy clouds on this bright but humid morning. Weather turned very sunny in the afternoon and it turned HOT. Martin came on site early to prepare the area surrounding the trench for the ‘Open Day’ on Saturday 27th by strimming back the foliage. Tony and Nick initially worked at the northern end of Trench IV removing context (48) to define the edge of the natural chalk Philip, Muriel and Mick are continuing to remove context (75) to define the edge of the chalk bank of the henge. Over the last 2 days we have exposed more than 2 inches additional depth for the bank. In Trench I, we have now planned contexts (25), (26) and (27) so the relationships in this complicated area are now better understood. Greg and Nick are working on the central posthole. They hoped to lift the packing material later today out of the fill. This was actually achieved at 14.30 in the afternoon. Mark, Nigel and Martin are working in the Inner Ditch excavating the turf layer (Context (98)). 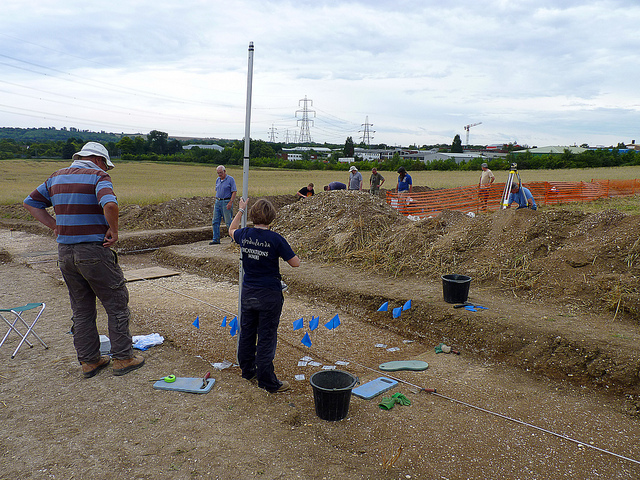 Jon, Ernie and Keeley have begun to excavate the Outer Ditch (context (59)) whilst Zoe is checking yesterdays records and cleaning up drawings and Christl and Lorna are controlling the recording of finds to move offsite. Although it was a hot and humid, a great deal of progress was made today. Today is another warm and sunny start, although the forecast is for a light shower around lunchtime and rain by 4 o’clock. While I trust these prognostications, I don’t trust their timing. We’ll see how it goes. Now that (35) has gone, we need to find out the relationship between (59) and (96). I suspect that (59) is material in the top of the ditch and that (96) is a soil or subsoil that survives partly owing to its position on the berm between bank and ditch. Whether is predates or post-dates the digging of the ditch is another matter entirely. The fills of the inner ditch are becoming more complex. There appears to be a patch of a harder deposit against the western edge; I suspect that this has already been partly removed to the north and is one of the reasons why defining this edge has always been so difficult. It appears to be overlying another deposit whose relationship with the turf line has not yet been established. Greg is continuing the excavation of the central posthole. He may have reached the bottom of the upper fill containing packing material, as it is becoming stonier. There have been no finds yet today, which is not really surprising given that it’s a posthole. I suspect that we’ll only be able to date it through radiocarbon sampling (assuming that we get big enough pieces of bone or carbonised wood). Mick, Muriel and Oscar are working on the colluvial subsoil, (75), that has formed against the bank of the henge. There is prehistoric flint-tempered pottery that is either Impressed Ware or an Early Iron Age type; I’m inclined to go for the former. These is also a reduced shell- and sand-tempered ware that does not resemble Harrold Shelly Ware or St Neots Ware; are we looking again at a Neolithic shell-tempered ware? Again, I need specialist advice on it. We still have relatively large quantities of finds. They are mostly fragments of animal bone and lithics but include a reasonable quantity of prehistoric ceramics. All of the sherds are small, even those apparently in situ and unaffected by post-depositional processes. This makes me think that the deliberate smashing of pots was part of the rituals going on here; the bone seems equally to be shattered into unnecessarily small fragments, more than would be expected for extracting the marrow. Are we witnessing a Greek style plate-smashing or Russian vodka glass smashing party atmosphere as part of the ceremonies? Caoimhín and Siân are working on the site matrix. It is relatively straightforward: after all, this is a rural site. Nevertheless, there is a definite stratigraphic sequence, which can be divided between the two (or more) phases. The main areas of complexity are the inner ditch and the activity deposits through which it was cut. The outer ditch is unfortunately stratigraphically divorced from the rest of the monument thanks to the presence of the berm. The weather is not changing vastly (a few greyer looking clouds are drifting over), so the lunchtime shower now seems less likely to happen. Nevertheless, the breeze is picking up slightly. 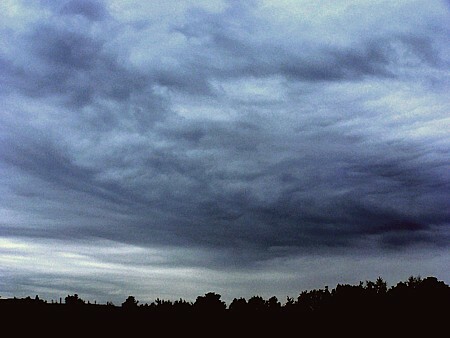 Within 15 minutes, the rain started… I’ll never get a job with the Met Office! By the end of lunchtime, the light rain had stopped and it was possible to go back to work as normal. It is now much cooler than before, with more of a breeze and the very occasional spot of rain. There was a light shower again at 2.45. During the afternoon, one of the teams had finished section drawing, so they moved on to investigating the north end of (48). 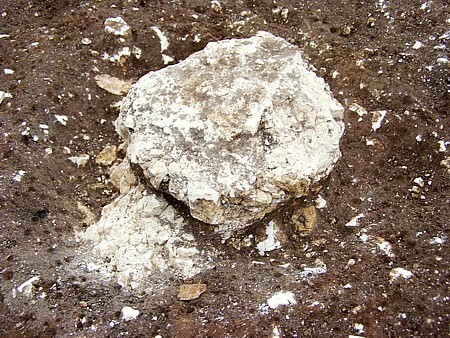 This is the colluvial deposit that forms uphill of the henge. Once again, all the finds appear to be of Neolithic type. Around 3.30, the rain returned, so we stopped work. Ironically, this had also more-or-less stopped by 4 o’clock, but there was no way of knowing that this would happen. We have wonderfully soft soil today as a result of yesterday’s heavy rain. It is very sunny, though, and I suspect that everything will dry out rapidly. Things are carrying on from where we left off yesterday lunchtime; one team is dealing with the remains of (35), another with the internal ditch, Mark is excavating the central posthole, Philip D and Tony are cleaning back along Trench I across the north-eastern part of the monument, while Lisa, Jon, Mick and Muriel are doing the sections of Trench IV. I’ve come out without my glasses, which are in the pocket of the coat I wore yesterday and which is now drying at home… There may be some “interesting” spellings on the blog today! Mark has found a potsherd embedded in the packing material of the central posthole. In its unwashed state, I think that it is Grooved Ware or something similar as it appears to be too dense a fabric to be an Early Bronze Age type. If my identification is correct and the sherd is not residual, it puts our second phase still well before the end of the thrid millennium. In cleaning in the bottom of the inner ditch, Chris has overdug slightly and has exposed an area of chalk on the west side confirming the line of slope seen in the chalk bank at a higher level. This means that we really do have a ditch here and it looks likely that the chalk to the west will continue under the turf line to join up with the chalky material to the east. The henge interpretation remains the best for what we have on site, thankfully. We now appear to have removed (35) completely, exposing (59) and (96) beneath it. The next thing will be to sort out the relationship between them. Caoimhín suggests that (96) is on top of (59), which sounds reasonable. There does seem to be some disturbance visible in section on the south side of the trench, in the area where there has been an isolated concentration of large stones and some industrial residue. Unfortunately, it’s invisible in plan and I wonder if most of it lies outside the trench. It’s sealed by the subsoil, (61), so it’s still potentially ancient. The finds (principally the rim forms found last week) suggest a Romano-British date. A sherd of what seems to be Grooved Ware has turned up in the superficial deposit, (99), above the turf line. It seems to be becoming the dominant material inside the henge, which is pretty much as I would expect. What I am finding slightly curious is the lack of Beaker material, which continues to encourage my belief that we are looking at an early henge, both in its formative phase and in its classic. Nothing I’ve seen so far forces me to think of a date as late asc 2200 BC. Despite the weather forecast, we are actually on site. The weather is autumnal but reasonable for digging, at least this morning. We are due for heavy rain by 1 o’clock, so we may have to make a rapid exit from site later. Chris, Phil and Nigel are examining the eastern edge of the inner ditch to make sure that it really is a silted up cut feature. I am still not entirely convinced by it, although the section on the north side of the trench looks very like a cut with fills. The removal of (35) is proceeding more rapidly. Caoimhín came up with a useful suggestion that no details on the object sheets are filled in other than the number, the co-ordinates and the object type. This gives us a lot more time for digging and lifting finds; the objects sheets can be completed as part of the initial post-excavation work. Jon and Lisa have started work on the north-east facing section of Trench IV. Although it’s a long one, it’s not complex and the main issue is the rapidly changing height, as it’s running against the contours. It will be useful, though, to see where the monument sits on the slope. It appears to lie at the point where a steep slope up from the bottom of the hill becomes more gentle, although this may be a misperception on my part caused by the location of Trench I across the centre. A turf line is turning up in the inner ditch, below (79). It shows up well in section and on the western side of the ditch. This suggests a period when silting was no longer taking place and grass began to develop in the ditch. This may provide a context for the trampling visible higher up: a tradition of movement inside the ditch may have been established when the grass developed and this continued after silting had started up again. It started to rain around 12.50. By 1 o’clock, it had become obvious that it was set to rain for at least several more hours and that everyone would be soaked to the skin by the end of lunchtime, so I decided to pack up for the day. At least we got half a day’s digging done, which is more than I had feared yesterday.